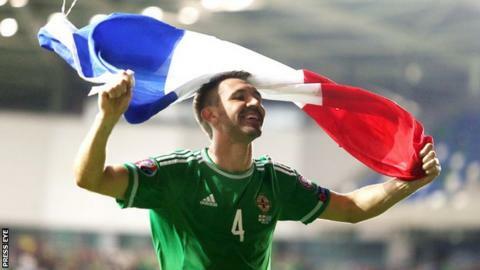 BBC Sport NI analyst John O'Neill says Northern Ireland have 'nothing to lose and everything to gain' after being handed a difficult draw for the Euro 2016 finals in France. Michael O'Neill's side are joined in Group C by world champions Germany, Poland and Ukraine. They will begin their campaign against the Poles in Nice on Sunday 12 June. Ukraine will be the opponents in Lyon four days later, followed by the Germans in Paris on Thursday 21 June. The 39-times capped former Northern Ireland defender reacted to the draw on BBC Radio Ulster's Sportsound programme. What of Northern Ireland 's opponents? "Ukraine will be the one Michael will be targeting as Northern Ireland's best chance to win a game. "We did well against teams of similar quality, like Romania and Hungary, in qualifying, so I don't think we have anything to fear against them. "Having followed Northern Ireland for years, nothing would surprise you in the other two games. "We performed best in the recent campaign when we were labelled as underdogs and we are going to start as underdogs against Poland and Germany. "I wouldn't be surprised if we nicked a draw against one of those and if we were also to beat Ukraine, then it should be enough to get us through to the last 16. "Poland had the top scorer of the qualifying series in Robert Lewandowski and our centre-halves will be relishing the prospect of pitting themselves against him." Chances of making the last 16? "Northern Ireland have absolutely nothing to lose. The way the matches have fallen may be to our advantage and if we can get something against Poland that would set us up. "Everyone involved with the team has done their utmost to get to the tournament so everyone is going to give it their best and the supporters will go there and enjoy it. "If it comes down to the last game against Germany and we need something from it, I wouldn't discount Northern Ireland. "If we could finish third in our group and England top theirs, then there is the possibility of meeting them in the last 16." And what about the preparations? "I think the Irish Football Association and Michael O'Neill should aim to secure difficult friendlies in the run-up to the finals, rather than fixtures against teams who have not qualified. "Countries who have been grouped with England, Wales or the Republic of Ireland may be keen to play us. "I think Michael will put out as close to his strongest team as he can but there will be a few players on the fringes who will be keen to force their way into the squad. "Having faced Poland and Germany in the qualifiers, Republic of Ireland manager Martin O'Neill will do anything he can to help too. "The build-ups to the 1982 and 1986 World Cups involved the toughest training I ever experienced in my career, tougher than pre-season training. "The players have a tough time ahead of them but I'm sure they're looking forward to it."